The Outside standout finally gets a video. Burna Boy's album Outside was released at the top of this year but it's so perfect for these hazy August days. The Nigerian artist's preferred term of his music is Afrofusion and that label definitely fits "Ye," one of the album's best songs that mixes pop, dancehall, and Afrobeats into its own unique thing. Today, The FADER is premiering a video for the song which features him surrounded by high-fashion and a very nice Bentley. 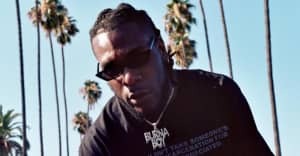 In an email, Burna Boy explained how the video came together. "Ye is a song that essentially shows the unrelenting nature of Nigerians (where I’m from). We thrive despite the leadership and circumstances. Everyone has big dreams that logically may or may not be achieved; Aspiring to have a Bentley, g-wagon regardless of their current situation. “I can’t come and kill myself” is an expression that means, you can’t dwell on things that aren’t working out or looking good, you only have one life after all. So the video was just a fun situation, I was trying to show the general idea behind that expression. Always strive to live your life to the fullest, as we hope for a better tomorrow."